I have been reluctant to comment on the attacks in Paris. As with a whole host of people who have popped up on television to make sense of last week’s violence, terrorism and European Muslim communities are not my areas of expertise. There has also been so much excellent written commentary on the topic that even if I were inclined to write, I would not have much to add. That said, I find the Turkish leadership’s response to the events in France striking. 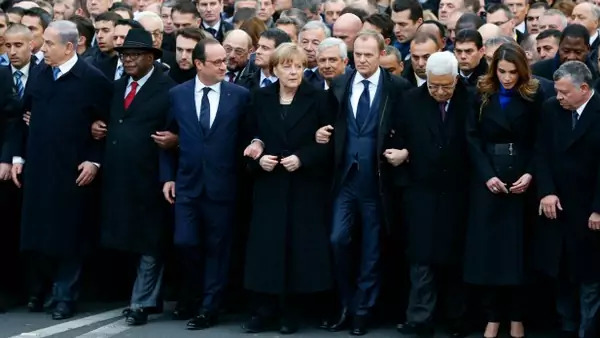 Prime Minister Ahmet Davutoglu took part in the solidarity rally in Paris on Sunday, but among the near universal denunciation of the Charlie Hebdo massacre and subsequent killings at the Hyper Cache market, the Turkish reaction was disturbingly equivocal. In a public statement after the assault on the magazine, the foreign minister, Mevlut Cavusoglu declared, “Terrorism and all types of Islamophobia perpetuate each other and we stand against this.” It is hard to disagree. Islamophobia, of which there is much in Europe and the United States, is bad, and terrorism is bad. Both are scourges that need to be fought, albeit in different ways. And while Davutoglu was more direct in his condemnation, cloaked in Cavusoglu’s outrage against anti-Muslim bias and terrorism, the foreign minister was saying something else entirely: The people targeted specifically in the Charlie Hebdo attack were Islamophobes who brought Cherif and Said Kouachi on themselves, producing a cycle of more Islamophobia and thus more violence. More broadly, Cavusoglu was signaling that the West is to blame for terror because it is irredeemably anti-Islam. Anyone who has been paying careful attention to Turkey understands that the foreign minister’s statement was calibrated and consistent with a message the Justice and Development Party (AKP) has been hammering away at for some time. It is hard to tell whether the Turkish leadership believes what they are saying or whether it is invoked as a political strategy to keep the party’s core constituency mobilized. Either way it is dangerous. To be fair, the Turks are not completely wrong. Although American officials and members of Congress bristle at the idea, U.S. policy in the Middle East and South Asia has contributed to the radicalization of people who are at the other end—intentionally or otherwise—of the awesome firepower of the United States. For the Turks, however, the problem stops with the American/Western alleged war on Islam. They steadfastly refuse to recognize that there are some people like the Kouachi brothers, Amedy Coulibaly, and, apparently, Hayat Boumedienne who believe that they are engaged in a violent struggle in the name of Islam against what they believe to be unbelief, separate and apart from what the United States or the satirists of Charlie Hebdo are doing. Despite the outpouring of attention because 16 non-Muslims were murdered in Paris, the people who the Islamic State and al-Qaeda kill are overwhelmingly Muslim, including Ahmed Merabet, the police officer gunned down on the street in front of Charlie Hebdo’s offices. On the same day that the Kouachi brothers went on their rampage, al-Qaeda slaughtered thirty-seven people in the Yemeni capital Sanaa with a car bomb. Are all these dead Muslims Islamophobes? For the longest time, there was a belief among analysts, government officials in the United States and Europe, and academics that Turkey, imbued with a tolerant and mystical variant of Islam, was “a moderate voice” of the Muslim world, as condescending as that sounds. Turkish officials would often make this claim to their Western interlocutors when making the case for Turkey’s EU membership. Now, officials in Ankara—well, at least the foreign minister—implicitly justifies murder based on something that is real, Islamophobia, but not actually a factor in the Charlie Hebdo or Hyper Cache murders. The cartoonists and editors at Charlie Hebdo may have harbored animus for Muslims, but it is hard to make the case that they were uniquely anti-Islam. According to the always-excellent Arun Kapil, they seemed most of all to dislike the combination of authority and hypocrisy. If the magazine did not exist, the perpetrators would likely have found other targets to attack in their war against non-believers. It goes to show how far the AKP has moved Turkey from a self-proclaimed bastion of moderation and tolerance to impetuous and implicit defender of extremism by invoking Islamophobia. Contrast Foreign Minister Cavusoglu with the Egyptian president, Abdel Fattah al-Sisi. It is true that the Egyptian strongman has a significant amount of blood on his hands and is decidedly not above blaming the West and the United States for a litany of his own self-made problems. However, on December 28, Sisi gave a speech before Egypt’s clerical establishment at the famous al-Azhar University in which he called for introspection about “Islamic thinking,” and not Islam per se, that strikes fear in the hearts of non-Muslims. It may very well be that historically Islam is no more violent than other religions, but Sisi’s call for critical examination—though it is not clear he fully grasps what he is implying—is a lot more productive than declaring the West made the Kouachi brothers do it.